An entertaining first quarter from both teams, as they scored two goals each. Crows were in control for the first half of the term and the Blues wrestled back some momentum in the second half of the quarter. Eloise Jones kicked the Crows first goal of the match from a 35-metre set shot. The Blues responded with a quick goal of their own via Katie Loynes. The Blues applied immense pressure around the ball and it set up a goal for Breann Moody who booted through the Blues second straight goal of the quarter. Hannah Martin with a great leading kick to Stevie Lee Thompson who marked well and kicked through the major. At quarter time Crows led narrowly by two points over Blues. It was a tight contest in the second term. The Crows run had stopped and this was credited to the Blues, as they lifted their intensity all over the ground. Also the Blues ball movement was smoother and cleaner. Bri Davey with a great handball under pressure to Natalie Plane who from the goal square nailed through the goal for the Blues. Maddie Prespakis led the disposals count with 11 at half time. At the main break the Blues were up by four points. The match lifted another gear in a third term that was free flowing, high scoring and high-pressured. Crows outscored the Blues four goals to three. Blues started the third stanza strongly and the Crows wrestled back the momentum halfway through the term. Chloe Dalton scored the fourth goal from a set shot. Crows defense under lots of pressure from the Blues especially Prespakis who caused the turnover and Blues captain handballed to Plane who kicked her second goal of the match. Thompson slotted through the much-needed goal for the Crows, as the Blues were all over them. Darcy Vescio straightaway answered with a dribbling Blues goal and her first this season. Erin Phillips with a clever high snap kick around her body towards goal square and Thompson marked the football and quickly put through the goal. Off the ball free kick awarded to Phillips in Crows forward line and the captain made the most of the free kick with the goal. 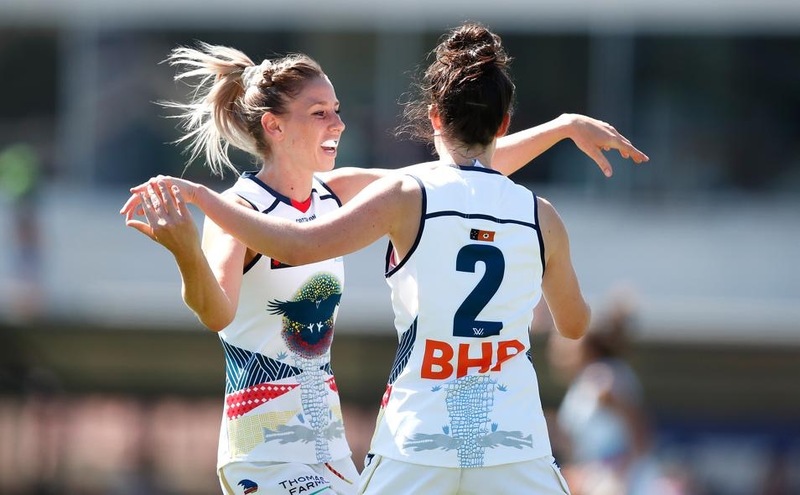 Crows with a brilliant passage of play and it resulted in a Sarah Perkins goal in her first AFLW match of 2019. At three quarter time the Crows were up by two points. The Crows continued with their strength and pressure around the ball and outscored the Blues three goals to one. Jones kicked her second goal of the match in the first minute of the final quarter. Sloppy defense from the Blues resulted in a Crows goal from Jess Foley and her first AFLW goal. Thompson who had been the most dangerous forward for the Crows kicked her fourth goal of the match. Prespakis awarded with a down field free kick was able to get the much-needed goal for the Blues. It was an impressive comeback 13 point win from the Crows, their first of AFLW 3.0 and the win keeps the Blues winless for this season. The Crows just had enough class around the ground when they required it and Thompson was the difference up forward for them scoring four goals.